Most biking routes have been discovered and explored by Campus and eventhorugh most of our tours are designed to be interesting and relaxing without being overly challenging, we also can put together demanding itineraries with fisical challenges and technical parts. Also there are many opportunities of easy downhill biking accompanied by a great adrenaline flow. We bike mostly small rural roads, dirt tracks (often single tracks) and also some cross country sections. We usually operate bike tours for several days or weeks covering varied natual areas. Some programs are combined with other activities such as trekking, mountain climbing and Amazon tours - and why not end the program with a cruise in the Galapagos ? Please contact us and together we will talormake your unique adventure. 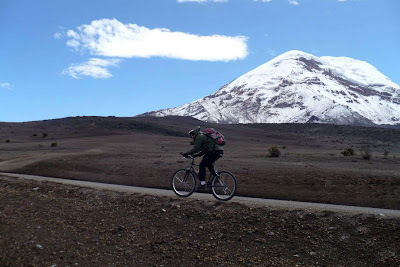 Below you will find a sample programm of 5 days biking activities around Quito and towards the north of Ecuador around beautiful landscapes.